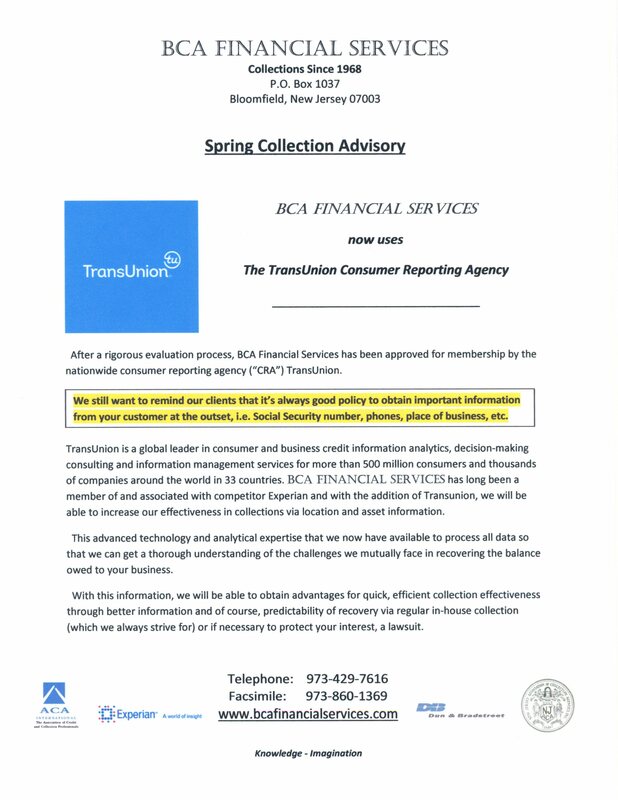 2019 Monthly Collection Agency Advice - N.J. Whenever possible you should try to avoid suit. Why avoid suit? 1. Because cost of litigation may not be practical. 2. Because a contested case may require a Plaintiff's representative to appear in court. 3. Because a judgment may prove a hollow victory if the defendant has no assets. 4. Because (in some contested cases) it may trigger a counter-suit. Check out our "Should we sue?" page here. Want to lighten up with historic collection fun in the Summer Season of 2018? Check out our "Collection" Blog where you find only a little advice but some fun collection history. 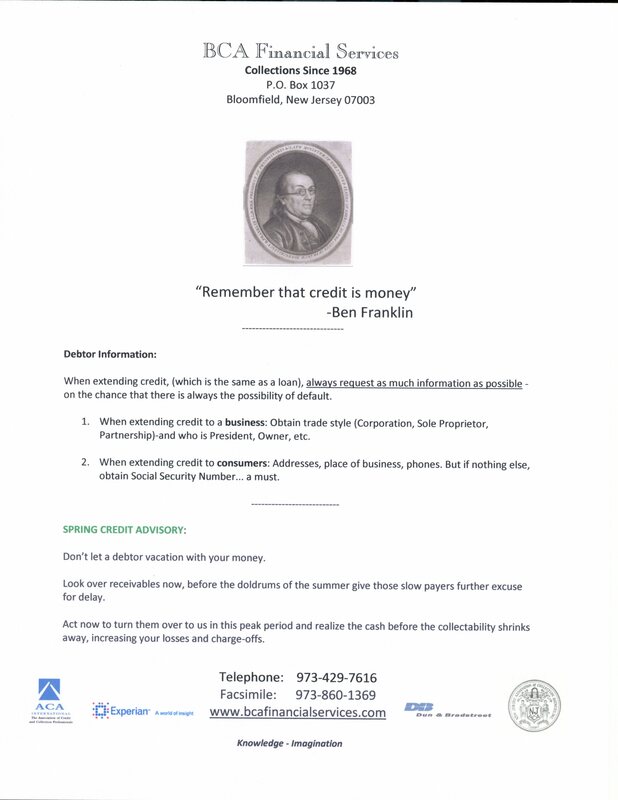 When extending credit, (which is the same as a loan), always request as much information as possible - on the chance that there is always the possibility of default. If nothing else, obtain your customer's (or patient's) Social Security Number...a must. Our skip-tracing sources: Experian Credit Bureau, TransUnion, Accurint, etc. are the most accurate with the "Social" as it is known. BCA Financial Services is online with TransUnion, Experian, the major nationwide credit bureaus, the States' Divisions of Motor Vehicles, and the states' Secretaries of State. All new claim submissions are checked for assets, i.e. real estate, lots, blocks, owners, employment, banking and addresses online. 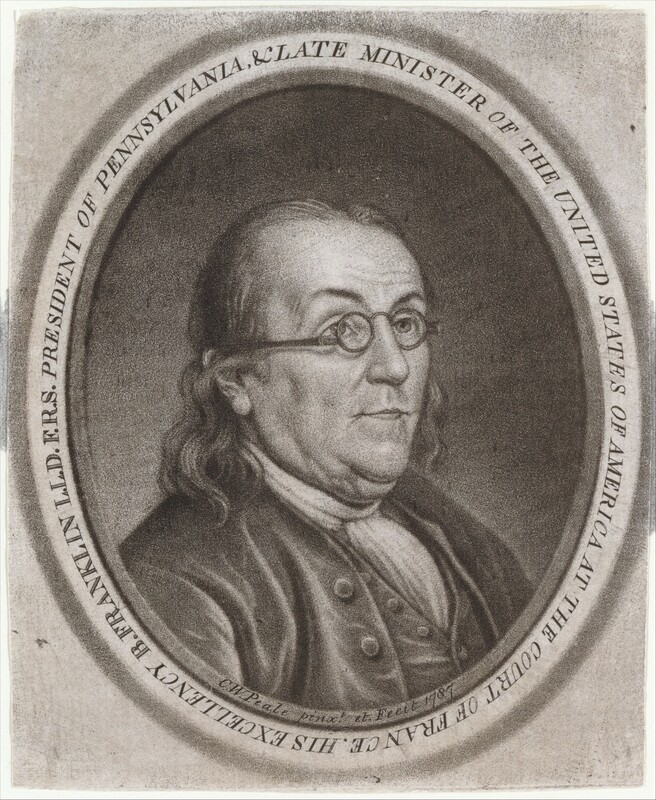 Based on the maxim that equity aids the vigilant and not those who procrastinate regarding their rights; Neglect to assert a right or claim that, together with lapse of time and other circumstances, prejudices an adverse party. Neglecting to do what should or could, have been done to assert a claim or right for an unreasonable and unjustified time causing disadvantage to another. Laches is similar to 'statute of limitations' except is equitable rather than statutory and is a common affirmative defense raised in civil actions. Laches is derived from the French 'lecher' and is nearly synonymous with negligence. In general, when a party has been guilty of laches in enforcing his right by great delay and lapse of time, this circumstance will at common law prejudice and sometimes operate in bar of a remedy which is discretionary for the court to afford. In courts of equity delay will also generally be prejudicial. But laches may be excused from ignorance of the party's rights; from the obscurity of the transaction; by the pendency of a suit, and; where the party labors under a legal disability, as insanity, infancy and the like. Watch for warning signs i.e. Calls not returned, promises not kept, mail returned or so-called disputes with more than one reason. YOU MUST ADD THE EXACT FEE PERCENTAGE YOUR AGENCY IS CHARGING YOU! No more, no less. When you deal with your customers, patients, clients, etc, if you have a contract, make sure you add it to your “collection costs” language. It can be as simple as: “unpaid accounts will be subject to collection costs of (?%)" (enter the exact percentage amount your collection agency is charging). Acceptance by our office of any check or payment instrument in an amount less than the full amount due marked as "Paid/Payment In Full" or otherwise indicated as full satisfaction does NOT constitute satisfaction of the current or future indebtedness to us and/or our client(s). Conditional Endorsements will also not be honored and are specifically waived. Our acceptance of any payment marked with a restrictive legend will not operate as an accord and satisfaction without our express prior written approval. Your debtor has an obligation to pay your bill. Turn them over for collection after the above intense period for maximum results. Will your acceptance of payment compromise our ability to recover the correct balance? Does the amount include any allowable fees, costs, etc? Has the account been placed with our attorneys for suit collection, thereby jeopardizing our ability to effectively bring the case to satisfaction (and recover the court costs you expended)? If it’s a partial payment, did you make a copy of the check? If the person at your office accepting the check is not yourself, did they note any language written on the check such as “paid in full”? Don't let a debtor vacation with your money. Look over receivables now, before the doldrums of the summer give those slow payers further excuse for delay. Act now to turn them over to us in this peak period and realize the cash before the collectability shrinks away, increasing your losses and charge-offs. Historical Collection Agency Blog "window envelope" comment. Please read: This is an update. ACA International seeks to dispel commonly held myths about the credit and collections industry. Today more than 30 million consumers have delinquent or defaulted accounts under collection, averaging $1,400 each. "Repayment of consumer debt is the lifeblood of America's credit-based system and vitally important to the national and state economies," ACA International Chief Executive Officer Pat Morris said. "It helps ensure that affordable credit is available, goods and services remain affordable, sustains jobs and supports keeping taxes low." "Whether a small town hospital, business or a city struggling to recover taxpayer owed dollars, organizations large and small rely on the recovery of rightfully owed consumer debt," Morris said. Myth 1: Avoiding a Debt Collector Makes the Debt Go Away.Consumers who ask debt collectors to stop contact or choose not to respond to calls or letters often mistakenly believe it means their debt has been eliminated. Avoiding contact will not erase a debt. Instead, consumers should communicate with collectors to discuss the account, verify its accuracy and work on a plan for resolution. If consumers don't owe the debt, communicating with collectors can help put a stop to calls or letters. Myth 2: Consumers Don't Have Rights in the Recovery of Past Due Accounts. The collection of consumer debt is one of the most heavily regulated industries in the United States. Consumers have important rights under a number of federal and state laws. For more information about what to do if contacted by a debt collector please visit www.askdoctordebt.org. Myth 3: All Debt Collectors are Bad. Just as "all consumers" aren't the same, neither are all debt collectors. Most are committed to professionalism, training and customer service. When it comes to the "bad guys," we want to put them out of business just as consumers do. ACA International and its members continue to work with state and federal policymakers, regulators, courts and attorneys general to comply with the law and hold accountable those who do not. Myth 4: It is Boom Time for Debt Collectors. It's no secret that consumers have struggled financially in the current economy. 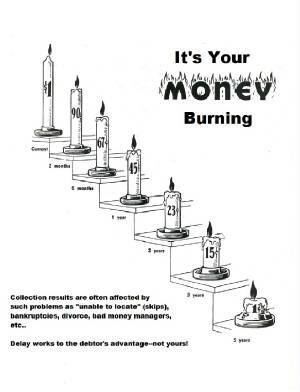 Despite an increase in defaults and delinquency, the inability of consumers to repay rightfully owed debts trickles down to those charged with their recovery. .
don't forget to click on BCA's "Collection BLOG"
COLLECTION LANGUAGE FOR YOUR CONTRACT or AGREEMENT TO ENFORCE COLLECTION FEES, ATTORNEY FEES AND, COURT COSTS SHOULD YOUR CUSTOMER DEFAULT. PAYMENT: Payments shall be made to (your company) on the basis of invoices for services rendered/product sold. Payment shall be due within 30 days of the date on the invoice presented. If client fails to make full payment due (Your Company) within thirty (30) days, a charge of 1-1/2% will be applied to the unpaid balance. (Your Company) reserves the right to terminate services/products under this agreement until full payment is made together with any accumulated charges. It shall be understood that is client fails to make payment within 60 days, (Your Company) will take action to enforce payment client will be responsible for all reasonable fees, expenses and costs of (?%) [enter the percentage your agency is charging] incurred by (Your Company) including but not limited to collection agency costs, arbitration and attorney's fees, court costs and any other claims-related expenses.